A Chinese robot has started exploring the far side of the Moon. The Chang’e-4 probe will explore the surface and carry out geological experiments. China plans to follow this up with further missions to return Moon rock to laboratories on Earth. But it’s not just scientists who are fascinated with the Moon’s hidden face. Musicians, film-makers and, of course, conspiracy theorists have all been inspired by that secret, barren landscape. For music fans, the phrase Dark Side of the Moon will forever conjure up Pink Floyd’s 1973 concept album. In reality, the far side of the Moon is not dark – we never see it because the Moon orbits the Earth at around the same rate it spins. All parts of the Moon receive sunlight. It’s likely that the members of Pink Floyd weren’t referring to this phenomenon of Tidal Locking with their album title, though. 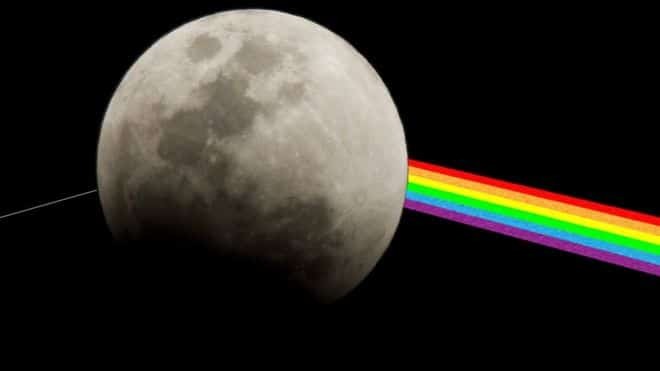 The Dark Side of the Moon, here, is a metaphor for mental illness. One of the first pictures of the far side of the moon. The Moon has been thought to have an effect on events – and moods – here on Earth for thousands of years. Ancient Babylonians recorded the phases of the Moon on clay tablets. But it wasn’t until Isaac Newton identified gravity in the 18th Century that we began to understand its effect on tides. In 1959 a Russian probe took the first photographs of the Moon’s hidden face, and it was first seen by the naked eye almost ten years later when American astronauts flew past. There seems to be something tantalising about the hidden side of the Moon, though. The thought that it’s always there, circling the Earth, yet just out of reach. And that’s sparked several conspiracy theories over the years. There have been claims that astronauts saw a secret lunar base there – even some kind of castle. And some have even gone so far as to suggest aliens were encountered on the lunar surface. Nasa, unsurprisingly, says there’s no truth to any of these theories. It does seem possible, though, that at the height of the Cold War between the USA and Russia, both sides considered using the far side of the Moon for a show of force. Reports claim there were plans to detonate a nuclear bomb there as a show of strength. Thankfully even if that’s true, the idea never got anywhere close to lift-off. Writers and film-makers have been inspired by the far side of the Moon, too, though none seem to have produced anything with the longevity of Pink Floyd’s masterpiece. A 1990 horror film entitled The Dark Side of the Moon tells the story of a group of astronauts who discover an abandoned shuttle there. They later discover it went missing in the Bermuda Triangle and is home to an alien which feeds on human souls. We haven’t had the chance to watch, but its average score of 2.6 on Rotten Tomatoes seems about right. In literature, the website Goodreads returns more than 200 results for books entitled Dark Side of the Moon, including a 1976 tale from children’s author William Corlett about the journey of a lonely, troubled astronaut. So whatever the Chang’e-4 probe tells us about rock formations and craters, it seems certain that the hidden face of the Moon will continue to exert a gravitational pull on imaginations here on planet Earth.